The reMarkable Paper Tablet comes with a Linux-based OS (Codex) that is optimized for low-latency e-paper. 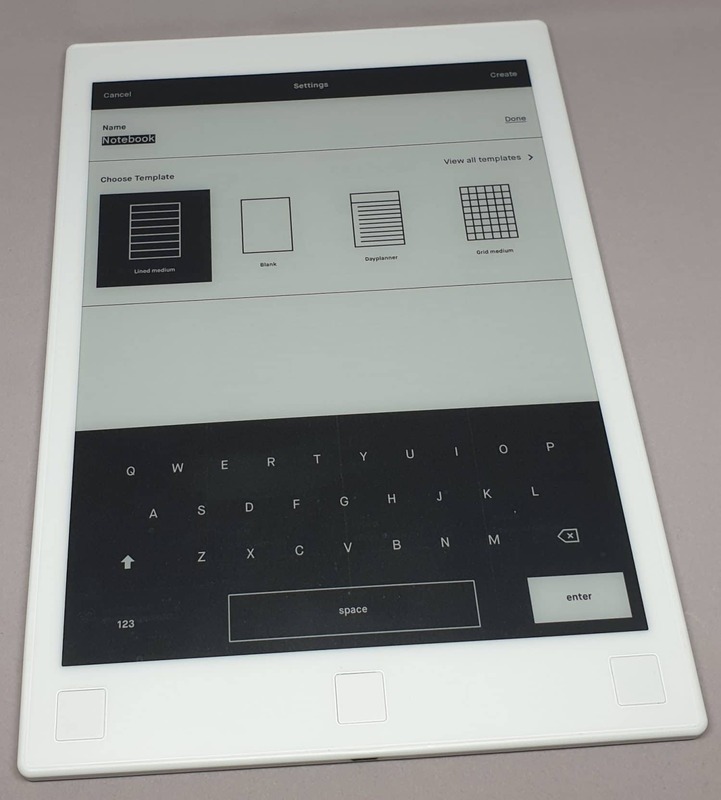 The main view is an overview of all the content on the tablet. You can have notebooks, documents (PDF’s) and Books (epub). The tablet comes with 8 GB of internal storage (and an equal amount of cloud storage) which allows you to store a lot of notebooks and e-books. It does also handle larger PDF’s, like a 200+ MB Dr Who comic I uploaded. In the image above I’ve uploaded a epub book, a PDF of a Bloom County-comic album (from Humble Bundle) as well as created a ton of different notebooks. 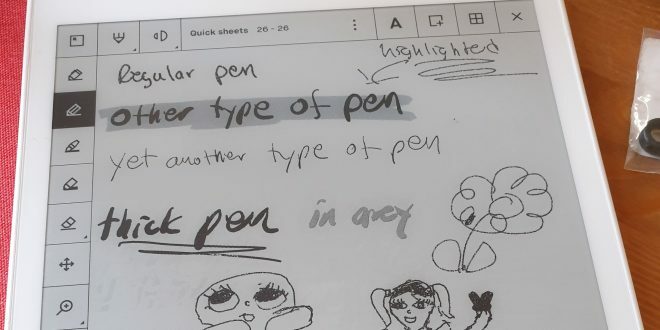 The main use is of course using the tablet as a notebook. While there are a Quick Notes notebook already created where you quickly can jot down stuff, the main way to use the reMarkable is to create a new Notebook just as if you bought a real notebook. 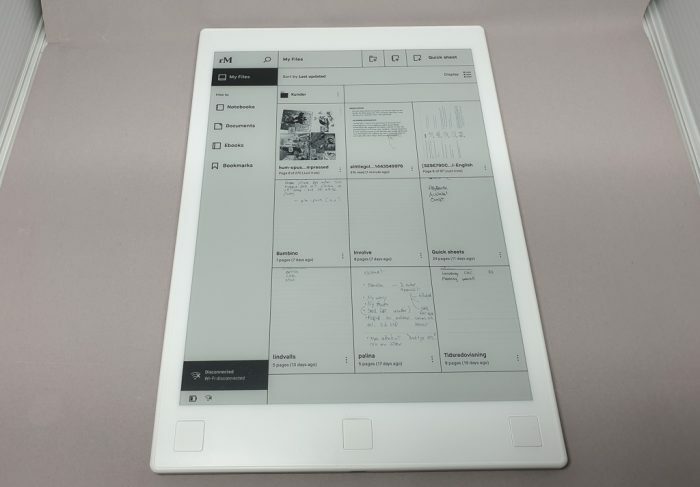 The advantage here is that this is a virtual notebook and you can have as many pages in it as you want. 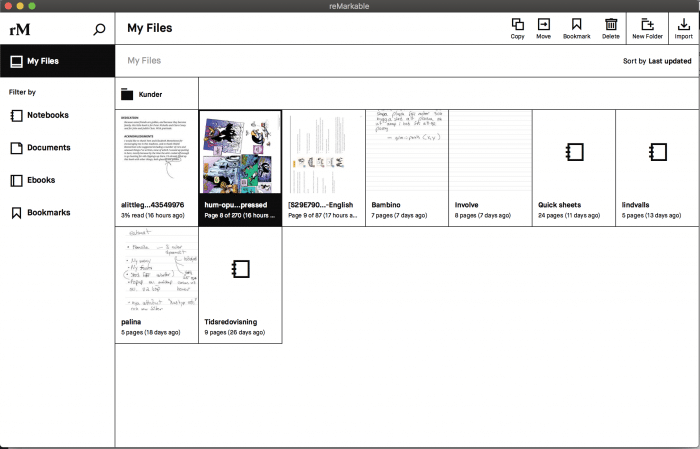 When you create a notebook you can choose the default paper-type. You can choose from blank, lined, grid and several more. You can of course change this when adding a new page later. If you want you can also create folders and put notebooks there to organise everything. In my case I now have notebooks for each of my projects all organised in sub-folders. At the moment of writing the reMarkable supports PDF and ePub-files. There is a promise for support for more formats later. To get the files to the reMarkable you use the IOS, Android, OSX or Windows app that we will look at in a minute. The only way to put stuff on the tablet is to use either the OSX/Windows program or the IOS/Android app. These software mimics the UI of the tablet and allow you to access all the notepads as well as add files to it (and remove files). The apps work well and it is easy to quickly bring up a notebook on the mobile devices to read notes. It is also easy to share documents and notes as well as organise them directly ion the app. The same goes for the Windows and OSX-app. The reMarkable Paper Tablet is an excellent digital note pad and have the feel of real paper when using it.